REVIEW | Matilda, UK & Ireland Tour. Probably one of the most exciting UK & Ireland Tour's has begun and it got off to a flying start at Leicester's Curve Theatre. 7 years ago RSC's Matilda gave its first preview in Stratford-Upon-Avon. Since then it has been transferred to the West End, won many awards, opening on Broadway as well as many other countries across the globe. So far, over 8 million people have seen the iconic story from the beloved Roald Dahl. Matilda is no doubt one of my favourite books from Roald Dahl, it's actually the book I am most excited to read to my children someday. The re-imagining of the story from Tim Minchin and Dennis Kelly has definitely established itself as a classic British musical and after the roaring standing ovation, it's easy to see why it's so loved. The story follows Matilda, a girl who blessed with extraordinary talents. Unfortunately, she's stuck with a set of parents whose priorities are as disconnected from their daughter as possible. Mrs Wormwood (Rebecca Thornhill) is desperate for more time with her extravagant dance partner Rudolpho (Matt Gillett) and spending less time bonding with her daughter and real life. Mr Womwood, on the other hand, is busy conning innocent motorists into buying rigged cars from him. Both of the parents are puzzled how they were able to produce a daughter with a natural flair for knowledge. They have perfectly portrayed the characters envisioned from the words in the original text. 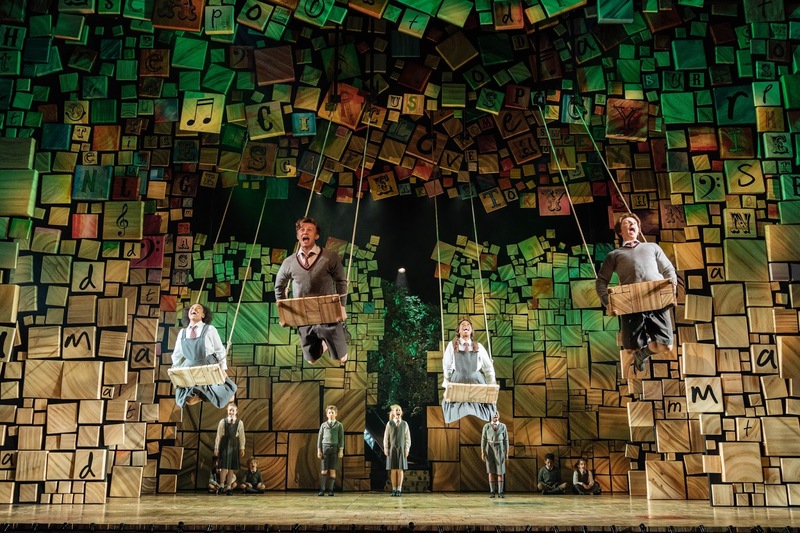 They believe that the only answer for solving Matilda is by sending her to school. Trunchball's Academy has always a been pretty terrifying place (who wondered if the chokey actually existed, er me!) and they didn't forget to acknowledge this in the stage production. Carly Thomas gives a beautiful performance of Miss Honey from the moment she steps on the stage. She captures the sensitivity and kindness that Matilda feeds from, the relationship between them both is really heartwarming. Of course, Miss Honey's determination to help Matilda's mind be allowed to be free is obstructed by the mean headmistress Miss Trunchball. Craig Els plays the terrifying Miss Trunchball with revolting perfection. He is outstanding as this character, he is nasty enough to scare the audience (yes he's as terrifying as you'd expect) but also incorporates perfectly timed humor. He has embodied the threatening character well. 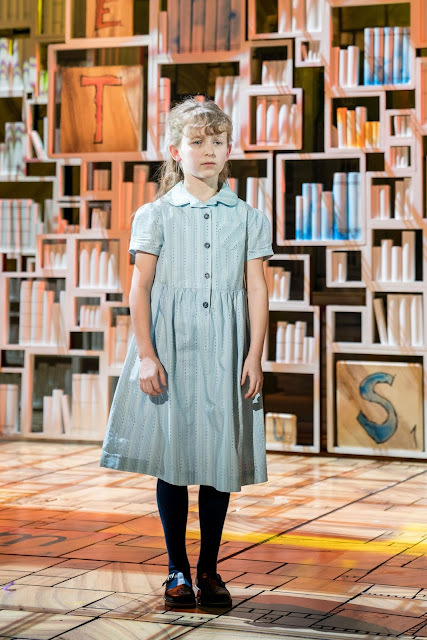 For our performance, we were warmed by the performance of Nicola Turner as Matilda. She was the perfectly timed timid but then "a little bit naughty" character that was also extremely captivating. She sings, smiles and bounces across the stage and into the hearts of the audience members. I'm completely in awe of how well she executed each scene. There is a definite future star in her. The entire young cast themselves were gorgeous, funny and had their own little personalities that really enabled them to be individual. So big thumbs up to Elliot Stiff (Bruce), Shaquahn Crowe (Tommy), Nick Seal (Nigel, Louella Asante-Owusu (Lavender), Lyla Toplass (Amanda), Maisy-May Woods-Smeeth (Hortensia) and Tayah Marshall-Brewster (Alice). Tim Minchin's score was incredibly punchy and addictive, I particularly loved When I Grow Up and Quiet, definite favourites. Peter Darling's choreography perfectly captured the energy of youth. The fast-paced movement was slick and the entire cast kept in sync with one another. I would not change my experience of Matilda. It championed brilliance and inspired hope. It was everything you would want from a fantastic musical; a fantastic score, a brilliant cast and lots of fun. I would love to see it again! 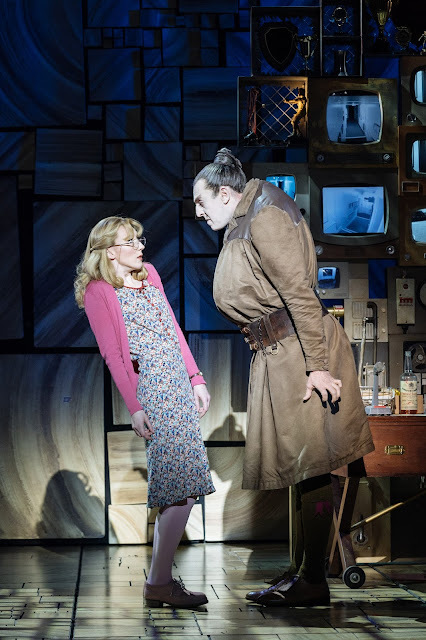 Matilda will run at Curve Theatre, Leicester until 24 March. There are limited tickets available on the Curve Website. 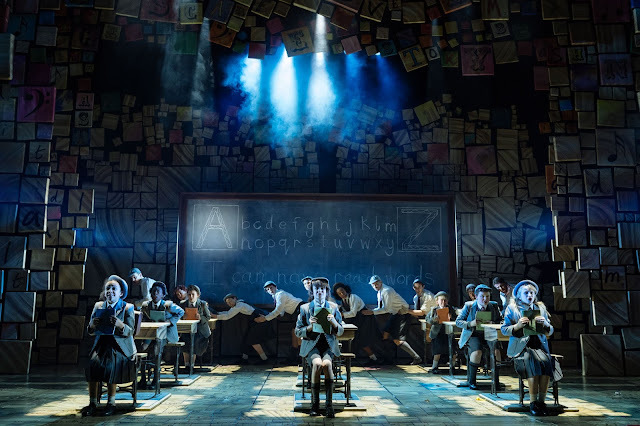 Its tour continues until 17 August 2019, you can find all of the dates on the Matilda on Tour website. A great review of Matilda, Emmie. I have managed to book tickets to see it at Birmingham in the Summer and I cannot wait. It will be the second time I have seen the show, and your review has got be very excited to see it again.